* Now through May 14, 2019, ALL reservations made for the 2019 season require a 3-night minimum reservation. Length of stay may not be shortened. Beginning May 15, 2019 we will start accepting 2-night reservations (except River Sites). Rates based on 1 Camping Unit per site – 2 adults & 3 children (18 yrs & under) Your dependent children! Add. chg. of $3.00 each for more than 3 children per night. Additional $5.00 per night. Three nights or more NO additional fee for Friday & Saturday nights. 4 adults on 1 camp site (no children) $6.00 per additional adult for more than 2 adults not to exceed 4 adults on a site. Extra vehicle – $2.00 per day. Boat – Trailer Parking Fee – Boat w/motor or personal watercraft $2.00 per day. Extra vehicle $2.00 per day. Canoe & Kayak $1.00 per day – Only 2 cars per site. Honey Wagon Service $6.00 – 9:00 A.M. to 4:00 P.M. 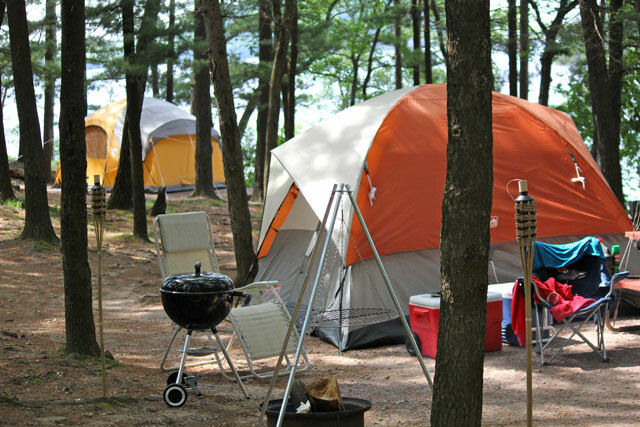 Most seasonal sites are separate from our overnight camping. Includes basic water and metered electric (30 or 50 Amp), free honeywagon service (1 per week) or sewer site, picnic table & fire ring. Many sites are wooded. Waterfront, bay view, bluff & secluded sites $2000.00 to $3000.00 per season. 150 sites w/sewer! (Must be 21 years old & older to enter) 2 seating areas with large TV’s – Card Tables – Games – Pool Table – Beer & Liquor Bar and Snacks. 4 Adults Maximum or 2 Adults with 3 Children (7th Night Free). Camper Rentals – Check in 4:00 p.m. – Out 11:00 a.m.
2 bedroom, full kitchen, bath & individual heat & A/C. Furnished w/eating utensils, pillows, blankets, sheets and TV and microwave. Rates – 5 people, includes site w/deck w/roof or Screen Porch. Cost includes site rental – no bedding. 4 person maximum. Two Double Beds, Heat, A/C, refrigerator, TV, picnic table, grill and fire ring. Check in 4:00 p.m. – Check out 11:00 a.m.
* Now through May 15, 2019, ALL reservations made for the 2019 season require a 3-night minimum reservation. Length of stay may not be shortened. Any reservations made after May 15, 2019 require a 2-night minimum reservation. Motel units include all linen w/maid service, small refrigerator, microwave, elec. heat, air conditioning, TV, picnic area, outside grills, picnic tables & lawn chairs. Units with 4 persons, 2 double beds. For daily visitors of registered campers and lodging guest – NO daily visitors allowed on weekends when park facilities are filled to capacity!! Daily visitor fee of $6.00 per adult – children 16 and under $3.00. ALL visitors must leave park by 10:00 P.M.
Advance reservations per phone or writing accepted. You will be held responsible for the number of nights you reserve! NO REFUNDS! Your deposit will be applied to your last night of your stay. 3 nights minimum on Holidays for all reservations. All reservations are held only to 12:00 Noon the next day w/deposit. NO pets allowed in any Rental Units or on Premises – pets will be allowed on campsites – Quality kennels are available nearby. Electric Golf Carts ONLY are permitted. Proof of liability insurance of $300,000 is required to use the cart within the park. You must present your proof of insurance upon arrival. Golf Cart driving hours are 7:00 a.m. – 10:30 p.m.
ATVs, UTVs, Gas-Powered Golf Carts, Mopeds and any vehicles other than an electric golf cart ARE NOT ALLOWED within Holiday Shores Campground & Resort. Camping Holidays – 21 days prior to date of arrival. All policies, rules & regulations are subject to change without notice. For further information, please contact our office at (608) 254-2717.